I decided to avoid making Lumat and Warok when I began making my own Ewok village, because I knew Hasbro woudl get around ot them eventually (I made Decipher's versions, which were two completely different Ewoks). I made Romba before I decided I shouldn't, and now that Hasbro is making him, I repainted him as Fernan, the mustached Ewok who can be seen behind Chewie as he hangs over the barbque. 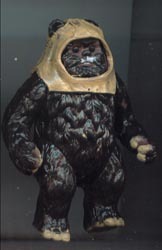 And since I mentioned Hasbro's Ewoks, thier upcming Lumat figure is Lumat's sculpt, but has Warok's coloring. Hopefully they'll fix it before release, but I'm doubtful.